If you are selling physical goods (actual real items) then you will need to charge your customer postage and packaging fees. 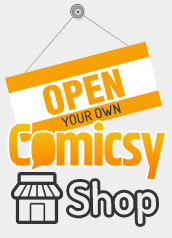 Comicsy encourages its sellers to assign realistic and responsible shipping fees to their items. Over charging is just slack, and will result in less sales, and feelings of bad will from the public (never good). Under charging is not advised either. Using this panel you can control your store’s shipping destinations. Comicsy is automatically set to ship to the following countries: Australia, Austria, Belgium, Canade, Cyprus, Denmark, Estonia, Finland, France, Germany, Greece, Hungary, Ireland, Italy, Latvia, Lithuania, Luxembourg, Malta, Netherlands, New Zealand, Poland, Portugal, Romania, Slovakia, Slovenia, Sweden, Switzerland, United Kingdom, U.S, and Yugoslavia. Below the ‘Target Countries’ menu is an important option titled ‘Select Shipping Method.’ This drop down box controls which type of shipping rule is applied to the whole of your Comicsy Shop. The defualt setting for all stores in Flat Rate International. Other options are available but this is the recommended choice. With this option selected, you will see the options below. If you wish to set a base fee for all your products, that will be applied to every order placed in your store, enter an amount in the 3 location fields. This amount is added once the to shipping total of each order placed in your Comicsy Shop. 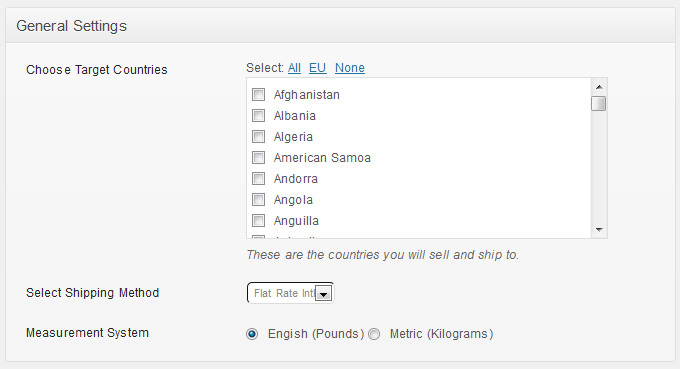 The Flat Rate International setting also opens up an identical menu on each individual product page. As you can see from the image below you can enter a price for the 3 locations that will only be applied to that particular product. There is also an extra ‘Additional Shipping Cost’ field in which you can enter another price. The amount in this field will be added to the postage & packaging fees regardless of the customers location. This means there are 3 different shipping amount you can add to your products. hopefully this should cover all options, allowing you to set the correct shipping fees for your customers.